Circa 1998, I wrapping up my time in college and was a big fan of A&E’s ‘Biography’. In part because I wanted to know what all laid in front of me and if I would be brave and opportunistic enough to make my own history like all of these folks. I remember when ‘Biography’ decided to do one on Donald Trump and he called in the next day to ‘Live with Regis and Kathy Lee’ to discuss it. I recall Trump saying he was happy with the piece, but his tone and demeanor sounded like he was wondering if there would be much more left to write about him. One segment showed the Secret Service training for all sorts of different scenarios that could happen at the inauguration, even role-playing with a weaponized drone. I’ve thought a lot about how a drone could be used as a weapon and if it’s been overlooked. 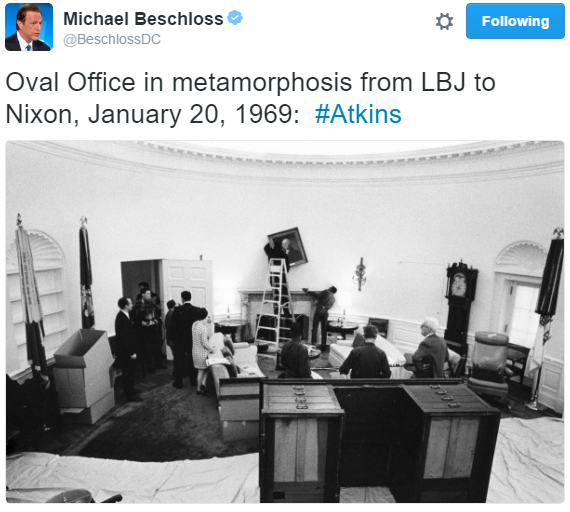 Scott Pelley introduced Bob Schieffer at the end of the telecast stating how the wise elder has reported on Washington and jokingly clarified he meant the city, not the first president. When DaughterGeeding realized Donald Trump was to become our acting president tomorrow, she asked if we could go to the store to buy Oreos before Trump gets rid of them all. I totally forgot he said that, but it reminded me what can stay in a child’s mind. 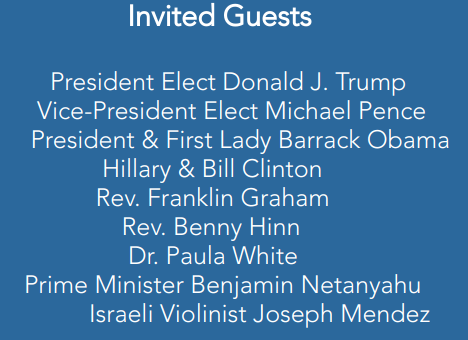 From the Presidential Inaugural Prayer Breakfast website, and this has to be awkward for a former first lady, but Benny Hinn?! And no George W. Bush? My first thought was Kip Dynamite’s famous line. My second thought was, there’s no need to upstage George Washington’s cabinet, which only had four members: Secretary of State Thomas Jefferson, Secretary of Treasury Alexander Hamilton, Secretary of War Henry Knox, and Attorney General Edmund Randolph. I’ve cooked bacon in the oven before, but yesterday was the first time I tried it by laying it on parchment paper. To my surprise, it worked great. Not so much by the cooking aspect, but the cleanup was a cinch. It was better than using aluminum foil. When I first read about this method I thought the grease would go through the paper and go all over the place, but not at all. Just make sure your paper is larger than your sheet pan. If you are a fan of HBO’s ‘Westworld’, you might appreciate these pictures of an abandoned amusement park north of Tokyo. I didn’t vote for Trump, but I’d prefer having him in the Oval Office than Ted Cruz. Go ahead, call my crazy, just refrain from any curse words or references to my mother, please. I’m absolutely certain I have a better 40 time than Donald Trump. We are the pastors of two New York churches with unique connections to President-elect Donald J. Trump. Patrick is the senior pastor of First Presbyterian Church in Jamaica, Queens, where the President-elect’s mother, Mary, an immigrant from Scotland, was a member, and where her son was baptized and confirmed. When he takes the oath of office, Mr. Trump will rest his hand on the Lincoln Bible and on the Bible given to him “by the Sunday Church School of the First Presbyterian Church, Jamaica, New York, Children’s Day, June 12, 1955.” Scott is the senior pastor of Fifth Avenue Presbyterian Church in Manhattan. Fifth Avenue Presbyterian stands closer to Trump Tower than any church in the city. Sitting in his office, Mr. Trump has a direct view of the Celtic cross atop the church’s spire. There’s a new trailer for the movie Logan, it’s the last time Hugh Jackman will play the role. You can tell in the opening scene they are in Texas, though I have no idea where or exactly how much of the film will take place in our state. Reggie Love: I would say probably the most satisfying memory was having to coach Sasha’s middle school team and seeing seventh graders execute the pick-and-roll flawlessly. 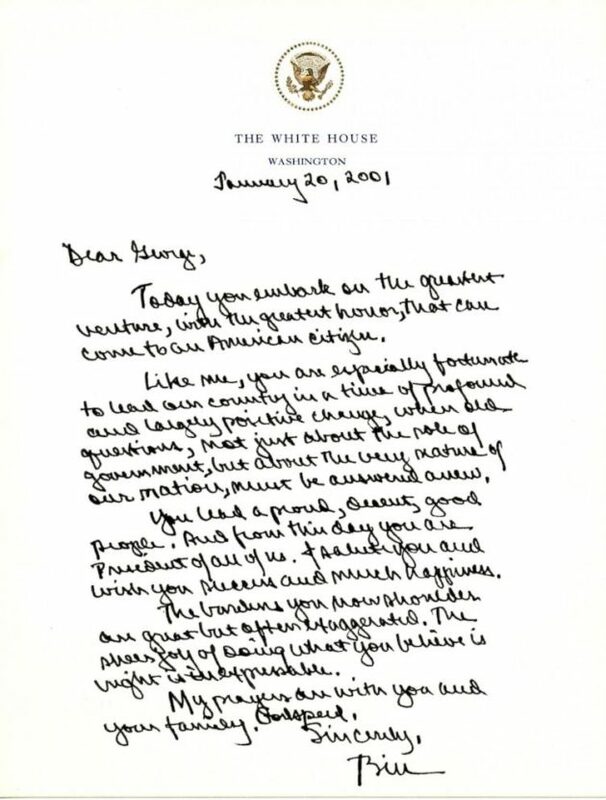 George W. Bush’s Inauguration Day Letter to Barack Obama – There’s a part of me that would prefer these letters would never be seen by the public. These come from the National Archives. And here’s Clinton’s letter to W.
Next time you do bacon in the oven, throw some brown sugar and a sprinkle of cayenne pepper on the bacon before cooking…comes out tasting like candy with just a hint of spice. Yeah buddy! – I like foil because, after I am done cooking the bacon, I take a corner and shape into a spout which it makes it easy to pour the bacon grease into a jar to save for later. – It's kind of weird that the Clintons are the only ones on that list without some sort of title. – In another part of that Logan trailer, there's a road sign showing that they are just a few miles outside of Ada, Oklahoma. I guess it's a road trip movie where the two mutants bond and have misadventures. Professor X will probably be like the Aunt Edna character in National Lampoon's Vacation. I'm getting to be a total politics nerd, watching hearings on C-SPAN and everything. Saw Ted Cruz's questioning during a confirmation hearing and was struck by the meanness; he acted more like a prosecutor or inquisitor than someone just seeking information from a person voluntarily testifying about one of the nominees. It came across as, "Mr. Smith, don't you agree that it's deceptive for an attorney to present only the facts that reinforce his position? Yes? Well then why did you fail to xyz?" Just seemed really mean-spirited. The whole point of people testifying about the nominees is to say, "I don't think you should confirm someone who ABC", or, "I think you should confirm someone who ABC" without necessarily stating the person's positions on D, E, and F.
Anyway, I would not have been happy to see him elected despite his intelligence. Oh, and – I'm a huge Springsteen fan – I think as much of him as you do of Bono. I read yesterday that he held an unannounced/unpublicized acoustic concert for the back-of-the-house staff at the White House last week. Classy guy. 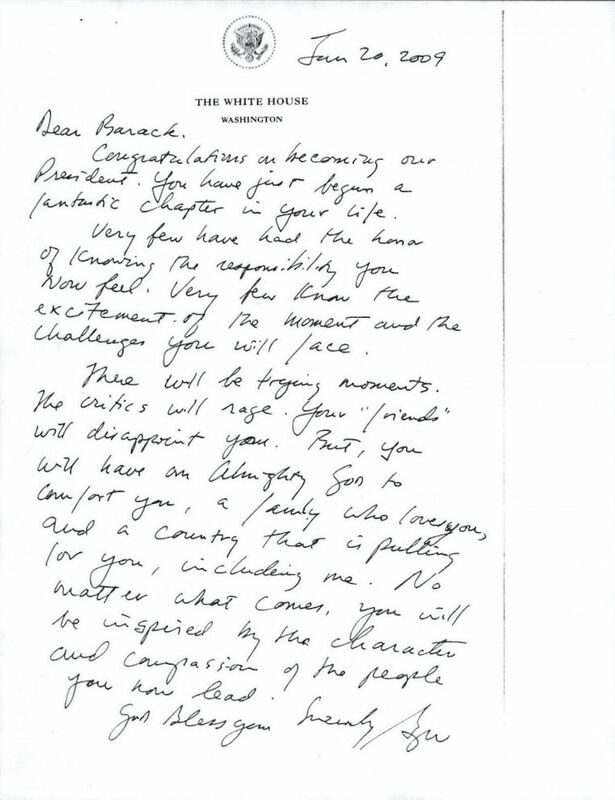 I am trying to imagine what Trump's letter to the next president will look like. I am always surprised when someone else in Texas feels as I do about Ted Cruz. I remind myself daily, it could be worse….Cruz could have won.